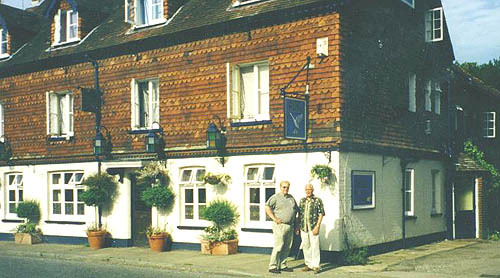 BtP adds: Gary has been a pub-owner before - The Parrot at Forest Green - so he knows his trade. Although we hope he will spend most of his time making and playing wonderful music, we sure wish to see him behind the bar. The Swan Inn will surely be a point of interest for Procol Harum fans. To the left are Jens and Gary under the Swan Sign : if any more Palers visit this pub, please send pictures and information to 'Beyond the Pale'. Other rock finance news: Roger Taylor (of Queen) has also just put 10,000 pounds into the fund that hopes to keep Manchester United Football Club from being taken over. "The pub has a nice garden with lots of tables for the thirsty: absolutely recommended on a hot summer day. Recommended also is the food at the Swan: the menu is varied and tempting, and the taste is well above the average English restaurant. Currently there are no sleeping accommodations, but plans are under way to add some rooms. I am sure this would make it a much-wanted place to stay when Gary is holding his Christmas gigs in Chiddingfold (there isn't one planned for 1999, however). But don't expect to see Gary behind the bar handing out beers. Apparently he only holds a small fraction of the ownership of the pub, and is not involved in the daily management of it."